When content is removed from the Internet following a DMCA complaint filed by a rightsholder the user who uploaded the content gets a chance to file a counter-claim. If successful this should reinstate the content but on YouTube things now appear to be working somewhat differently. It transpires that YouTube has a special deal with Universal which sees content taken down at the record label's request and DMCA counter notices blocked with no chance of appeal. Over the past few years and during the last 12 months in particular the DMCA notice has become a key tool for rightsholders to fight copyright infringement online. However, on thousands of occasions the original notices are flawed, targeting incorrect or non-infringing ‘fair use’ content. In these instances someone targeted by a wrongful DMCA takedown is usually given the chance to file a counter-claim stating why content should not have been removed. Content then has the opportunity to be reinstated or removed if the dispute cannot be settled. While counter-claims provide a balance to a DMCA complaint, there is evidence to suggest that YouTube, one of the biggest receivers of copyright notices online, is in some cases disallowing them. When a video is uploaded to YouTube it’s put through the company’s Content ID system and compared against digital fingerprints provided by copyright holders to check for infringement. YouTube user John McKelvey has discovered that if you fall foul of signatures provided by certain rightsholders then your content gets taken down – and remains down – even if no copyrights have been infringed. Here’s what happened. McKelvey has been publishing an ongoing series of hip hop history videos, each taking a look at classic, rare or overlooked records. One featuring Eric B. & Rakim caused the latest issues. “This video, like all my other videos in the same vein, are Fair Use in a number of ways at the same time,” McKelvey told TorrentFreak. Furthermore, McKelvey has gone to some length to ensure that his videos feature only incomplete clips, all of them deliberately recorded at below MP3 quality so no one will be inclined to rip them. At every available opportunity he encourages people to buy content and refuses to upload MP3s, even though he says viewers are constantly asking him to. Unfortunately Content ID doesn’t understand the concept of fair use (or being ‘fair’ in general) and when the system scanned a video of McKelvey chatting about an old Eric B. & Rakim vinyl it was flagged up as infringing and disabled. McKelvey sent TorrentFreak copies of his correspondence with YouTube as he tried to get his video back online. The responses from YouTube highlight a worrying development, one which means that certain labels are ALWAYS right in copyright disputes, even when they’re wrong. My video is NOT a competitor to sales of the [Eric B. & Rakim] song. It directly encourages viewers to buy it for themselves. Anyone seeking a pirate copy would in no way be happy with my video as a substitute. We received the attached counter notification in response to a complaint you filed with us. We’re providing you with the counter notification and await your notice (in not more than 10 business days) that you’ve filed an action seeking a court order to restrain the counter notifier’s allegedly infringing activity. Such notice should be submitted by replying to this email. If we don’t receive notice from you, we may reinstate the material to YouTube. Thank you for your counter-notification. The complainant has reaffirmed the information in its DMCA notification. YouTube has a contractual obligation to this specific copyright owner that prevents us from reinstating videos in such circumstances. Therefore, we regretfully cannot honor this counter-notification. YouTube enters into agreements with certain music copyright owners to allow use of their sound recordings and musical compositions. In exchange for this, some of these music copyright owners require us to handle videos containing their sound recordings and/or musical works in ways that differ from the usual processes on YouTube. In some instances, this may mean the Content ID appeals and/or counter notification processes will not be available. So, it seems that where YouTube has a record label deal (and that could be any label, no list is provided), those labels are allowed to take down any content they like for any reason they like – infringing or not – and YouTube will block its users from having the right to reply. As noted by FairUseTube, while YouTube has a legal obligation to remove allegedly infringing content on request the same cannot be said for accepting counter-notices or reinstating content. Nevertheless, the one-sided nature of the process is bound to increase frictions between those defending right to fair use and those who feel rightsholders are constantly eroding it. “I was shocked when the reply came in saying how it didn’t matter if my video was Fair Use or not, because they had some secret contract with the labels and were refusing to honor my counter-notice anyway,” McKelvey says. “It was very frustrating, because it showed me that it no longer mattered whether I had a legal right to post my videos. At least in this case, YouTube has stopped siding with the users because they’ve apparently been bought off by UMG. It’s also frustrating because this new policy was not disclosed to us, so we’re set up to file useless counter-notices only to have them work against our channels,” he concludes. While YouTube now openly admits having preferential deals with labels, that hasn’t always been the case. 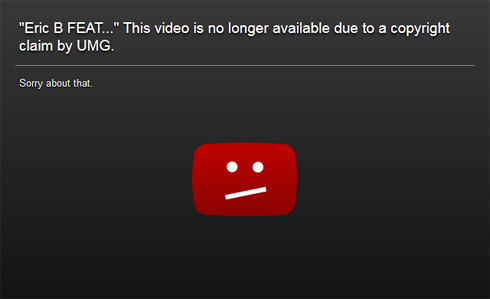 In December 2011 the Google-owned company initially allowed Universal to blatantly censor Kim Dotcom’s ‘Mega Song’. It was later reinstated. Check out John McKelvey’s hip hop blog here.